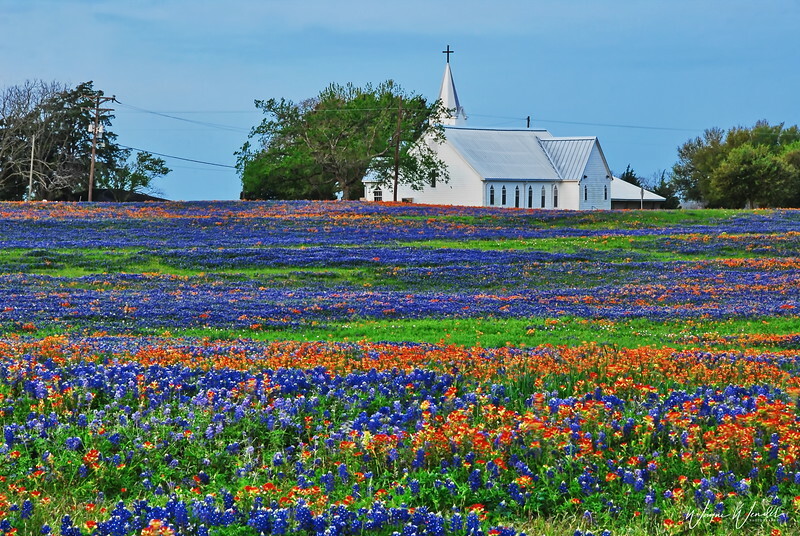 I keep hoping for another year like 2009 when the wildflowers across Texas just exploded into a sea of blue, red and yellow and pink. I took this photo in the early morning. I heard about this field thru the internet and went to check it out. My buddies want to photograph this same field and church the next year so we returned only to find it was a plowed field. Lesson, when you see a great photo, take the time and really do it right. There is no next week, next month or next year. Do it now. What gorgeous colors! Fantastic photo! Incredible bluebonnet photo, plus all those gorgeous red flowers, as well! Wow! The stark white church is a perfect foil for the colorful field of wildflowers. A good cautionary tale, too, about tomorrowism. We've all been guilty of it, and been bitten by it, I'm guessing. Oh my!!! This is stunning. Yes, 2009 was a watershed year for wildflowers. This is amazing. Being a Texas, you gotta know I love this!